I have decided to take part in the QGBI Contemporary Quilt Group Journal Quilt Challenge for this year. The main criteria are that quilts must be 12"x6" and that participants have to choose to work in either landscape or portrait orientation and stick to it for the quilt we make each month, no chopping and changing. I have opted to work in landscape layout and have also agreed some rules/guidelines with myself for the challenge. 1. I will only use fabric from my stash (although I may buy threads). 2. 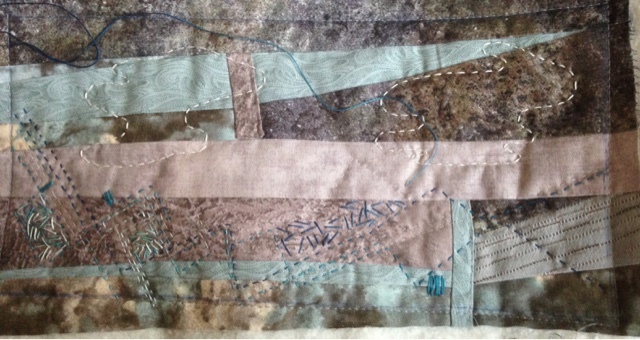 Some fabric from January's quilt is incorporated in February's quilt etc, to provide a link and some flow. 3. The quilts are based on mood and seascapes. 4. Each journal quilt will include some lettering, words or haiku. January's quilt in progress is shown above. The sea is dark and murky, storms have taken place and there is fear and sadness. Roll on Spring! Looking good, Lis. I shall follow with interest. This will be interesting and I like your personal rules.